Bang & Olufsen stereo for Vantage | What Car? Bang & Olufsen has announced more audio systems custom-designed for Aston Martin cars. The new versions are available as options for the V12 Vantage and V8 Vantage models, and build on the success of the BeoSound DBS system launched last year. The BeoSound V12 Vantage and BeoSound V8 Vantage systems were 'developed exclusively for Aston Martin to be perfectly matched to the respective car models, both acoustically and physically'. 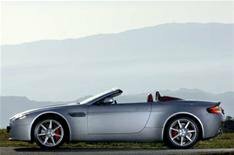 In addition, the BeoSound V8 Vantage package for the V8 Vantage Roadster adapts to suit the different characteristics of the car with its roof up or down. Both set-ups use ICEPower amplifier technology and B&O's Acoustic Lens Technology tweeters, designed to give 180 degree horizontal dispersion for better soundstaging everywhere in the cabin. The motorised tweeters pop up when the system is activated. The systems will be available as a factory-fit option for 4648.